Combine water, thyme, and garlic in small pot and bring to a boil. Add quinoa and reduce to a simmer. Cover and let cook for 15 minutes or until all water is absorbed. Let quinoa cool thoroughly. Once cool, mix quinoa, peppers, onions, feta, parsley, and nuts in large bowl. Add desired amount of dressing and serve. Can be made 1 day ahead and will last 2_3 days. Combine all ingredients in blender except for oil. Blend together and slowly drizzle in the oil. Season with salt and pepper to taste. With summer right around the corner, Green Apple is gearing up to bring new and innovative ideas to our events. What better way to gain inspiration than to visit the city of Portland, Oregon, popular for its “foodie” reputation and commitment to serving local, fresh and sustainable ingredients, much like our mission at Green Apple. On May 24th, Kris Brown, Cheryl Seaton and newest sales member, Kassie Seaton, boarded an Amtrak train ready to indulge in what the city had to offer. All aboard! 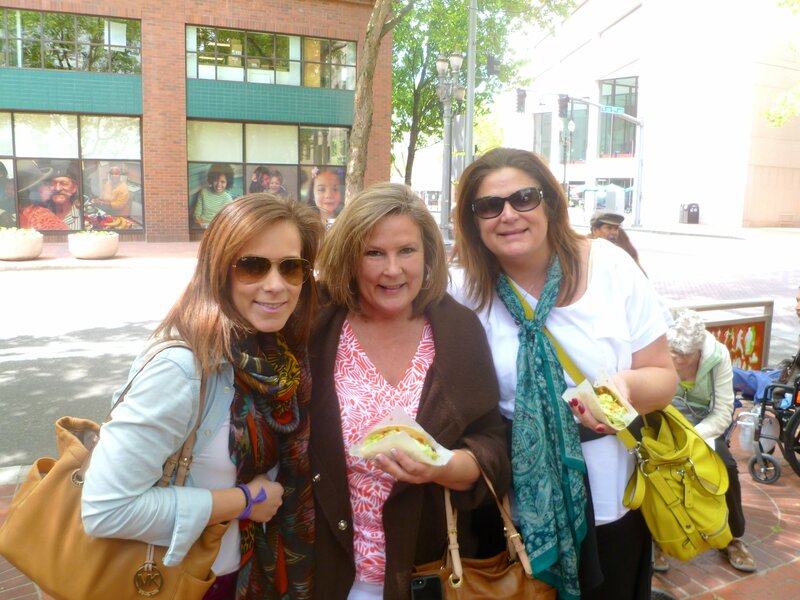 We arrived in Portland ready to celebrate co-owner Kris Brown’s birthday and surprised her with a walking tour of Portland’s famous curbside cuisine, food carts. Food carts are unique to Portland in that they are not the typical mobile “roach –coaches” you might have pictured in your head – they are stationary carts grouped in pods and regulated by the city. 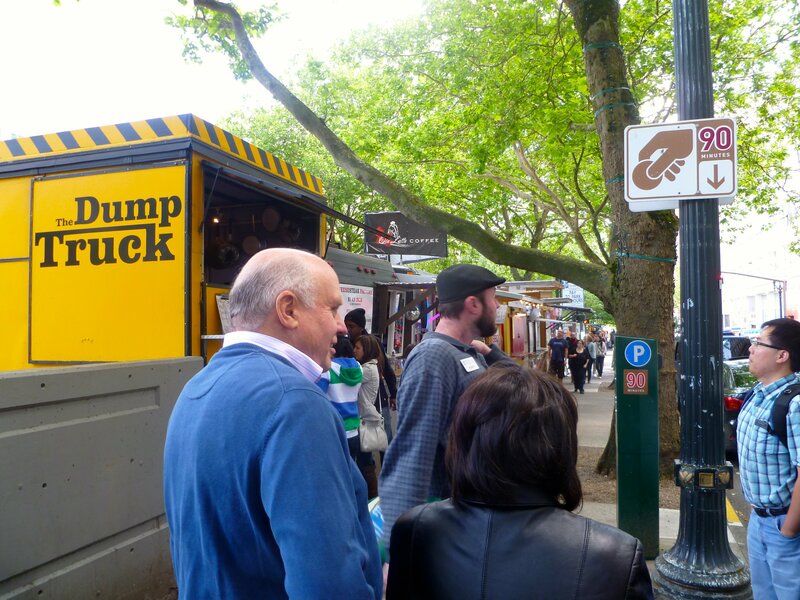 Many of the food carts in Portland are managed by former top chefs of four-star luxury hotels and restaurants wanting to branch out and cook dishes they are passionate about. Our tour began at a cart called “The Dump Truck” serving delicious pork and shallot dumplings. One bite and you are hooked as the juicy pork delights your taste buds. Next stop, “Euro Trash”. Much like the first cart, this cart has a unique name with an even more unique menu: deep-friend mushrooms and anchovies. This cart was a hit amongst our group. The mushrooms were deep-fried to perfection and the anchovies were surprisingly tasty. Our tour made its way through the streets of Portland, meandering through the food cart pods, stopping at the most creative, unique or appealing carts. One of the most notable stops was at a cart called “Korean Twist” serving Kobe Beef Tacos topped with fresh cilantro and hot chili sauce. You can’t be afraid of getting a little messy at this cart, these tacos can be hard to handle but are completely worth the stain on your shirt! Our food cart experience was so much fun, we all had an absolute blast. We came home from Portland excited to share this adventure with our readers and customers. Please let us know if all this talking of food has sparked an interest in a summertime party with perhaps some Korean BBQ or gourmet waffles and Green Apple will make it happen! Until next time, cheers!